Logo used from 2005–2017. Still used alternatively. The original stretch of the expressway, from Balintawak Interchange up to Guiguinto Exit in Bulacan, was completed on August 4, 1968. It is a fully fenced limited-access highway that consisted of a four-lane rural divided roadway, nine twin bridges, one railroad overpass, seven underpasses and three interchanges. Originally a project of the Department of Public Works and Highways, the completion of the major portion of the job fell on the Construction Development Corporation of the Philippines (CDCP, the precursor to PNCC) to pioneer the toll concept of funding infrastructure. It was carried out under the private financing scheme provided by Republic Act 3741. Additional work required by the government included the construction of the Balintawak – Novaliches Interchange Complex, the Tabang Interchange, and the approach road of the underpasses. In 1976, the NLT extension, consisting of 50.9 kilometres (31.6 mi) of concrete road, was built as part of a highways program of the International Bank for Reconstruction Development (World Bank) linking major urban centers to the production centers in the north. The project features a 4-lane limited-access highway with a five-kilometer Candaba Viaduct, a construction innovation utilizing precast beam system, 6 interchanges, 12 bridges, and overpass/underpass structures. In 1989, under the Corazon Aquino administration, the expressway was extended by another 5 km from its terminus at Dau Exit to Sta. Ines Exit in Mabalacat, Pampanga. From 2003 to February 2005, the expressway underwent a major rehabilitation. Works included the widening of the Balintawak – Tabang segment from 6 to 8 lanes and the Tabang – Sta. Rita segment from 4 to 6 lanes, asphalt overlay, and the demolition of old tollbooths. The main contractor of the rehabilitation work was Leighton Contractors Pty. Ltd (Australia) with Egis Projects, a company belonging to the French Groupe Egis as the main subcontractor for the toll, telecommunication and traffic management systems. To help maintain the safety and quality of the expressway, various rules are in effect, such as restricting the left lane to passing vehicles only and banning overloaded trucks. After the rehabilitation, the operation and maintenance of the expressway was transferred from the state-owned Philippine National Construction Corporation (PNCC) to the Manila North Tollways Corporation (now NLEX Corporation). On June 5, 2010, the NLEx Segment 8.1 or the NLEX Mindanao Avenue Link, a four lane, 2.34 kilometres (1.45 mi) spur road that runs from Mindanao Avenue to the SMART Connect Interchange in Valenzuela City was opened. The spur road is a part of the C-5 Road North Extension and is built to provide another entry point to the expressway from Metro Manila and decongest the Balintawak Interchange. On March 18, 2015, NLEX Segment 9 or the NLEX Karuhatan Link was opened, a 4.06 kilometer long continuation of Segment 8.1 that runs from the other side of the SMART Connect Interchange to MacArthur Highway. The North Luzon Tollway (NLT) or NLEX Main cuts northwards from Manila to the provinces of Bulacan and Pampanga. The expressway parallels MacArthur Highway from Quezon City to Mabalacat in Pampanga. It has 8 lanes from Balintawak Interchange to Balagtas Interchange, 6 lanes from Balagtas Interchange to San Fernando Exit, and 4 lanes from San Fernando to Sta. Ines Exit. The expressways has bridges that cross seven rivers. Some portions of the expressway are lined with billboards, including its viaduct portion. Various high voltage overhead power lines, most notably the Hermosa-Duhat-Balintawak transmission line, operated and maintained by National Grid Corporation of the Philippines (NGCP), utilize the significant portion of the expressway route as the densely populated areas hinder acquisition of dedicated right of way. Northbound lane of NLEx in Lawang Bato-Lingunan area, Valenzuela, before the construction of Dulalila Overpass. The expressway starts at Balintawak Interchange as a physical continuation of Bonifacio Avenue. A few meters after the cloverleaf is the Quirino Highway, with a northbound exit ascends into the flyover. The Reparo Road will parallel the expressway from Novaliches Exit to Eternal Gardens Memorial Park. A Libis Baesa Exit can be seen near the memorial park but it only serves a southbound lane. The road approaches to Balintawak toll plaza, widening to 17 lanes and only serving northbound. The offices of NLEX Corporation is located near the toll plaza. A new toll gate was built between a northbound and southbound lanes servicing Class 1 vehicles and opened in 2017. The number of lanes will return to 4, continues straightward, passes to Tullahan River through the Tullahan Bridge, intersects with General T. De Leon Street, and passes the Smart Connect Interchange. It then passes through industrial areas and businesses within Valenzuela. An East Service Road starts paralleling the expressway before Paso de Blas exit. On Valenzuela Exit, a Puregold supermarket and Malinta Market can be seen between it. The road continues on a straight route, with a Caltex service area located near the Dulalia overpass, until it enters Bulacan. It crosses to Meycauayan River and after a few meters is the Meycauayan Exit to serve its town proper. Another service road named St. Francis Service Road that is located beside the expressway's southbound lane. It passes through residential areas and institutions within the municipality, intersects with Lias Road, and continues straightforward. On Marilao, there is a Petron service area and after it are the Marilao River and its exit. It enters Bocaue after Marilao Exit, where Ciudad de Victoria and the Philippine Arena lies to the east. The road turns eastward to serve Bocaue toll plaza, with a southbound lane being widened to 22 lanes with 4 from a service road making a grand total of 26 lanes, and on the middle of it is a newly built toll plaza and road. It turns westward, passes through Bocaue Exit, Santa Maria River, and Taal Bridge, and continues on a straight direction until Balagtas Interchange. Before it are the Petron for southbound and Shell for northbound lanes. Past Shell service area is the Tabang Spur Road and Balagtas Interchange which was opened on March 20, 2012. This is the former terminus of the original segment of an expressway from 1967 to 1976 before it is extended to Dau. A typical section of NLEX near the Santa Rita interchange in Guiguinto. Street lights can be seen on the middle of a road from where a grass median was located before the widening project in 2016. The expressway reduces the number of lanes into three starting on Tabang Spur Road. It continues on a straight route, passes through Guiguinto River, Shell of Asia service area, Metro Warehouse Bulacan, Santa Rita Exit – the north end of AH26/N1 portion of NLEX. A few meters after Pulilan Exit is the Candaba Viaduct (officially known as Pulilan-Apalit Bridge). The bridge passes over rice paddies and swampland that are located within the municipalities of Pulilan, Calumpit and Apalit, and Pampanga River before the viaduct ends. (For more information about a route description of the viaduct, see Candaba Viaduct). The expressway continues straightforward, passes through Total and Caltex service areas, San Simon Exit, Abacan and San Fernando Rivers, and San Fernando Exit. The SM City Pampanga and Robinsons Starmills Pampanga malls are seen from the expressway. After San Fernando Exit, the expressway narrows into 2 lanes, both northbound and southbound. It continues as a straight roadway, passing through Paskuhan Village, Petron Lakeshore, Mexico Exit, Acle and Biyabas Overpass, Shell southbound service area, Raslag Solar Power Plant, Abacan and Quitangil Rivers, Angeles Exit (formerly a parclo interchange), Marquee Mall, former location of Dau Toll Plaza, Sapang Bago Bridge, Dau and SCTEX Exits, Mawaque Road, and it ends at Sta. Ines Interchange, with a toll plaza to serve an exit. The segment between SCTEX and Sta. Ines Exit used to be a two-lane road but has since widened into four lanes. Tabang Spur Road is a spur road which branches out of the main alignment of NLEX at Balagtas and proceeds to MacArthur Highway at Guiguinto Exit. The entire spur is located in Guiguinto. It starts at an interchange with MacArthur Highway and will pass to Tabang Toll Plaza, where the offices of Tollways Management Corporation are located. It will cross the Guiguinto River through the Guiguinto Bridge and pass the river is an overpass. The road continues eastward and another overpass named Tabe 1 Overpass crosses the road. It will turn westward and cross the PNR Railway and Sapang Ugong River through PNR and Sapang Ugong bridges, respectively. The road turns eastward for the eastbound vehicles and westward for those entering the spur road, where it ends and enters the NLEX Main. The Segment 8.1 (Mindanao Link) of the NLEx looking west towards the Smart Connect Interchange. The Segment 8.1 (Mindanao Link) starts at the Smart Connect Interchange with NLEX Main, picking-up from where Segment 9 (Karuhatan Link) left off. On the other hand, Segment 9 starts after Segment 10 crosses the MacArthur Highway on Valenzuela. The level of the road in Segment 8.1 lowers past the interchange. It will pass to Que Grande, where its overpass is located. It enters Quezon City, with another overpass located on this portion and past that is the Mindanao Avenue toll plaza. After the toll plaza, it will parallel to Detour Road and ends on Mindanao Avenue. Segment 10 starts on a western terminus of Segment 9 (Karuhatan Link). It intersects with A. Pablo Street, passes through Lienado and Araneta Subdivisions, Tullahan River and Governor Pascual Avenue. The highway enters Caloocan, where it will pass Samson Road and various establishments within the city. The NLEx Segment 8.2 will be a 7.85 kilometres (4.88 mi) segment that will connect NLEx segment 8.1 to C-5 Road and Commonwealth Avenue. The planned segment will at first run parallel to Republic Avenue before making a southward turn to Luzon Avenue after which it will then connect to Commonwealth Avenue. The segment will include two interchanges in Mindanao and Regalado Avenues, a roundabout connection at Congressional Avenue, and three local road crossings at Quirino, Sauyo, and Chestnut Avenues. The NLEX Segment 10 is a four lane, 5.65 kilometres (3.51 mi) elevated expressway that runs from the NLEX Karuhatan Link to C-3 road. This segment now opened to traffic in March 1, 2019 and the R-10 road section will be completed by January 2020. Plans for a construction of an elevated road to connect North Luzon Expressway (NLEX) and South Luzon Expressway (SLEX) has been bared long before the construction of Segment 10.1. The government has reportedly accepted an unsolicited proposal from Metro Pacific Tollways Development Corporation (MPTDC) to build the 13.24 kilometres (8.23 mi) road. MPTDC is a subsidiary of Metro Pacific Tollways Corporation (MPTC), which runs NLEX. Known as the Connector Road project, the elevated expressway will have run over the Philippine National Railways tracks until terminating to the Skyway Stage 3 Interchange. It will be connected in the north to Segment 10, constructed through the cities of Caloocan and Valenzuela. In the south, it will be linked to the Skyway Stage 3 near PUP in Sta. Mesa. Once completed, the Connector Road will have four entry and exit points: C-3 Road in Caloocan, España, Quirino Avenue in Manila and terminating through the Paco-Sta. Mesa Road in Santa Mesa, Manila. This project is targeted open to traffic on February 2022. Construction of the project is estimated to cost ₱17 billion, but as an "all-elevated" structure, right-of-way acquisition shall be reduced to an estimated cost of only ₱2.41 billion. It broke ground on February 28, at the same time Segment 10.1 was inaugurated and opened to traffic, officially indicating that the NLEX Karuhatan Link and Segment 10 are mostly complete. This consists of three segments with an approximate length of 58 km from San Simon, Pampanga to Dinalupihan, Bataan connecting to Segment 7 in Subic Freeport. The tollway has two sections: an open section and a closed section. The open section (within Metro Manila) charges a flat toll based on vehicle class and is employed to reduce the number of toll barriers (and associated bottlenecks) within the metropolis. The closed section is distance-based, charging based on the class of vehicle and distance traveled. When the expressway was modernized, an electronic toll collection system was set up for Class 1 vehicles while prepaid magnetic cards were assigned to Class 2 and 3 vehicles to speed up transactions at toll booths. These have since been replaced by a unified ETC system operated by Easytrip. Also, with the government's thrust towards toll road interoperability, Autosweep of the SMC Corporation which operates SLEX, Skyway, STAR, NAIAX, and TPLEX has been accepted as a mode of payment in NLEX since March 2018. As of October 1, 2011, all tolls (as shown below) include the 12% Value-Added Tax (VAT). With the movement of the northernmost toll gate to Sta. Ines, the NLEX and SCTEX toll systems have been merged into one combined system, with tolls for all enclosed destinations listed. 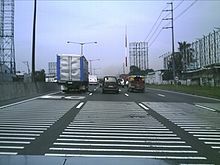 Much of the expressway has been built to U.S. Interstate highway standards, featuring eight lanes through Metro Manila. As it enters the more rural area north of Manila, the expressway narrows to 6 and then 4 lanes with a grass median to separate the two carriageways. All signage is in English, and are nearly identical to the "big green signs" (BGS) on American expressway, including white lettering on a green background, with the exit tab in the upper-right corner (distance signs even employ a font similar—if not identical—to the Caltrans font; all other signs employ a different font). Like expressways in most American states, the NLEx uses a distance-based sequencing for numbering interchanges. Being a metric country, though, the system is kilometer-log rather than mile-log—exits numbered according to the distance (in kilometers) from Rizal Park in Manila, which is designated as "Kilometer Zero" in Luzon. The NLEX has 8 lanes, 4 lanes in both directions from the Balintawak to Burol segment, 6 lanes with 3 lanes for both directions on the Burol to San Fernando segment and 4 lanes with 2 lanes for both directions on the Tabang Spur and San Fernando to Santa Ines segment. Before the lane expansion project of 2016, there was even a part of the NLEX which consists of only 2 lanes, one for each direction. This segment is located after passing through the SCTEx Exit (Northbound) but has since been expanded into four lanes. 100 km/h for cars and jeepneys, 80 km/h for trucks and buses, and 60 km/h is the minimum for all classes of vehicles. Speed limits are strictly enforced via CCTV cameras and speed guns, and speeders are usually identified as soon as they hit the tollbooth. The upgrade consisted of rebuilding of roads and building new toll plazas. Launched in the beginning of 2003 and completed in February 2005, the roadway now has modern features explained above. The entire stretch of the expressway underwent another rehabilitation regarding its drainage systems. The expressway is known to be flooded during the rainy season and the goal of the project is to fix the drainage systems within the road to prevent flooding. Within this period, certain lanes of the road were closed to the traffic. This in turn caused massive traffic jams along the road and the speed limit on the construction sites were reduced from 80/100 km/h to 60 km/h. The program started on 12 February 2007 and finished on 7 October 2007. Emergency telephone boxes are located throughout the whole length of the expressway. Parking bays (lay-bys) are also placed on regular intervals on the expressway, for use in emergency situations. North Luzon Expressway has 7 service areas, mostly located on the closed toll section north of Bocaue. Each service station hosts a gas station, restaurants and a convenience store, as well as ATMs and restrooms, with the exception of Petron in Valenzuela, which only has a Petron gas station, San Mig Food Ave convenience store, and car repair and lubrication services. NLEX as seen from Camachile Flyover in Quezon City. Also seen here is the Novaliches Exit. Exit numbers are based on kilometer post. Exits begin at 9 because the NLEx is a logical continuation of Andres Bonifacio Avenue. Rizal Park is designated as Kilometer Zero. 5.6 Balintawak Cloverleaf N1 (EDSA) / AH26 – Cubao South end of AH26 concurrency. Southern terminus. Continues south as Bonifacio Avenue (N160). Link with the future Metro Manila Skyway Stage 3. 5.6 Novaliches N127 (Quirino Highway) Northbound exit and southbound entrance. 6.2 Libis Baesa Libis, Baesa Southbound exit only. 8.7 Mapulang Lupa Mapulang Lupa, Paso de Blas, Parada Northbound exit only. Demolished. 11 17 Lingunan Lingunan, Canumay, Lawang Bato Southbound exit only. 12 19 Libtong Libtong Northbound exit only. 13 21 Pandayan Pandayan Southbound exit only. 14 23 Marilao (closed) Marilao Northbound Exit only. Replaced by a new exit with the same name a few meters north. 15 NLEX-C6 Interchange Links to the proposed C6 expressway. Interchange type not yet known. 16 Cuidad de Victoria Interchange Bocaue, Santa Maria Links to the Cuidad de Victoria and alternate route to Bocaue and Sta. Maria. 17 Bocaue toll plaza B (electronic toll collection, cash payments. Southbound only). North end of barrier toll system. Start of closed road toll system. 17 Bocaue toll plaza A (electronic toll collection, cash payments. Southbound only). North end of barrier toll system. Start of closed road toll system. 19 Balagtas-NFEx Interchange Unopened Interchange. Construction temporarily stopped in 2011 due to the delays in developing the site of the project. 20 32 Tabang Tabang, Guiguinto, Malolos Half-Y interchange. Northbound exit and southbound entrance. 21 34 Balagtas Balagtas Half-Y interchange. Northbound exit and southbound entrance. 24 38 Santa Rita Plaridel, Baliuag, Cabanatuan Folded diamond interchange. North end of AH26 concurrency. 28 45 Pulilan Pulilan, Calumpit, Baliuag, Malolos Diamond interchange. Serves as access point for southbound motorists to Baliuag and Malolos. 40 65 San Fernando San Fernando, Olongapo, Mexico, Gapan, Pampanga's Best Half-partial cloverleaf and half-diamond interchange. Access to SM City Pampanga and Sky Ranch Pampanga. 45 72 Mexico Mexico, Dalisdis (Mexico), Panipuan (San Fernando) Trumpet interchange. 50 81 Angeles (closed) Angeles, Magalang Parclo interchange (1984–2005) demolished. Replaced by a current exit few meters north. 50 81 Angeles Angeles, Magalang Trumpet interchange access to Marquee Mall. 53 85 SCTEX E1 / E4 (SCTEX) – Clark Airport, Tarlac City, Baguio, Subic Half T/Half Trumpet/Half Y interchange. Route transition from E1 to E1 (spur). Northbound exit and southbound entrance. Future for Trumpet Interchange. Mindanao Avenue N128 (Mindanao Avenue) East end of expressway. Link to the future NLEX Segment 8.2. Karuhatan N1 (MacArthur Highway) Exit to Karuhatan, Valenzuela City towards MacArthur Highway. The entire route is located in Guiguinto, Bulacan. All of these exits are still pending construction. NLEX Connector (Segment 11) Skyway Exit Ramp Manila This will be an entry/exit ramp in Quirino Avenue, Paco, Manila. This exit takes the motorists to the common alignment with the northern extension of Skyway Stage 3 which travels over the C-2 Road, some portion of the Osmeña Highway and further into the South Luzon Expressway, this may have few exits and therefore a faster route. NLEX Connector (Segment 11) España Toll Plaza This toll plaza is located at NLEX Connector. NLEX Connector (Segment 11) España Exit Ramp This will be an entry/exit ramp in España Boulevard, Sampaloc, Manila. This exit takes the motorists to the proposed northern extension of Metro Manila Skyway which travels over the C-2 Road, some portion of the Osmeña Highway and further into the South Luzon Expressway, this may have few exits and therefore a faster route. NLEx Segment 10 Malabon Exit Ramp This will be an entry/exit ramp in C-3 Road, Dagat-Dagatan Ave., Caloocan. NLEx Segment 10 Radial Road 10 Toll Plaza This toll plaza is located at NLEx Segment 10.1. NLEx Segment 8.2 Congressional/Luzon Avenue Exit (End of Expressway) This exit is the end of NLEx Segment 8.2/NLEX–C5 Link, goes to the C-5 Congressional/Luzon Avenue. The expressway was featured in the music video to the song "Toll Gate" by the band Hale. It was also featured in the movie Sa North Diversion Road in 2005, based on Tony Perez's stage play of the same name. It was created by Dennis Marasigan. From 6–17 June 2007, On North Diversion Road, the play written by Tony Perez, was performed at The Arts House, Singapore, by young & W!LD, an actor training division of Singapore's W!LD RICE Theatre. ^ Rama, Michelle (2016-02-23). "A history of forgetting". Rappler. Retrieved 2018-09-14. ^ "MNTC | Projects". Manila North Tollways Corporation. Retrieved 2018-09-14. ^ "Toll Table". Manila North Tollways Corporation. Retrieved 2018-09-14. ^ "MNTC to start P2.6-B NLEX road-widening project this month". Manila North Tollways Corporation. Retrieved 2018-09-14. Wikimedia Commons has media related to North Luzon Expressway.